The palace, replacing an earlier wooden palace, had been built in 1871 for Sultan Abdula'ziz by court architect Serkis Balyan. The construction took four years and cost four million gold pieces. The ceilings and the interior partitions were made of wood, the walls were covered by marble. The columns were superior examples of stonemasonry. The palace was lavishly decorated with rare carpets, gilded pieces and furniture inlaid with mother-of-pearl. 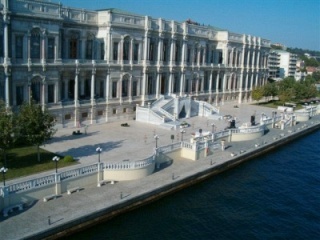 Like other palaces on the shores of the Bosphorus, the Ciragan had been the venue of various important meetings. Its facades were decorated with colored marbles, it had monumental gates, and it was connected to the Yildiz Palace on the slopes behind it with a bridge. On the landside it was surrounded by high walls. After remaining in ruins for many years, the palace has been renovated and turned into a 5-star seashore hotel with several new additions.